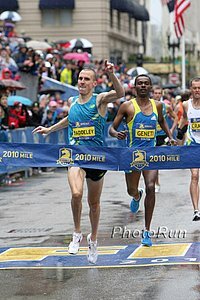 Bill Rodgers....was he good enough to finish in the top-5 or 10 in today's marathons? USATF Previews USA vs. The World Events At Penn Ryan Gregson should run DMR for Australia. Great job by the USATF getting these previews out there ... good read. Oregon Track Club Sending Symmonds, Leer And Jenna Simpson To Penn Relays Both the OTC and Oregon U. are making cross-country appearances at Penn, which we applaud. Specially-Organized Airlift To Bring Top Africans To London Wanjiru, Abel Kirui, Kibet, Mutai, pacemakers are being specially transported to London through Eritrea (yikes) and Spain. What a story! Watch Out, Wanjiru: London Times Writer Says Britons Lemoncello and Dan Robinson May Move Up In Rankings Thanks To Others' Travel Fatigue Great Britain's elite deserve much credit for their efforts, but this sure is wishful thinking. Usain Bolt Will Make 100m Season Debut In Daegu May 19 The man is doing the IAAF a huge favor with this move. Title IX Policy Stiffened By Feds New policy shores up what some pols called a loophole that female-hating schools can exploit. And of course it's George W Bush's fault. 1,700 Elementary And Middle Schoolers Compete At Meet In Orange County, CA News sent to us by an interested LRC fan. Cycling And WADA Dealing With Blood Plasma Transfusions By Elites In 2003-2006 Cheat now and you may be caught later. Cheruiyot The Younger And Merga Party In Boston Proving "That No Matter The Culture, We Distance Runners Are Among The Geekiest In Society." More Here.